You need to install the plugin below. I am assuming that you know how to install a plugin. Note that this plugin requires Eclipse 3.x to run, and, because I ended up using a countdown latch from the concurrent utility package in the 5.0 JDK, there is a Java 5.0 requirements as well. Hopefully, that's not a big deal because the JRE that one uses to run eclipse is independent of the JRE that you develop your application for. 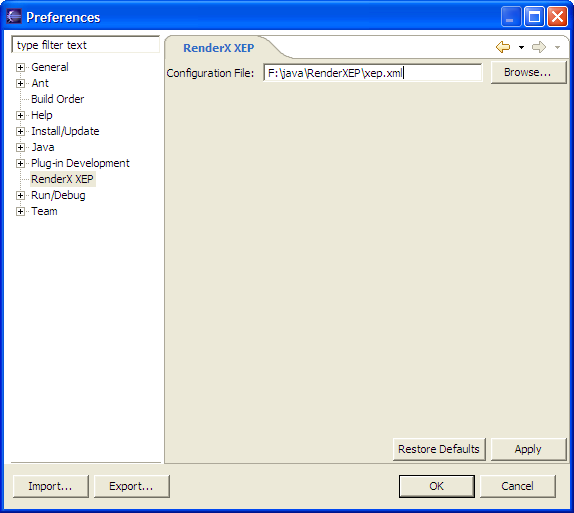 XEP includes a license file, and the location of this file must be specified in the RenderX XEP preference page before using the plugin. See the screenshot below for an example. Subsequent usage is very straightforward. Select a valid file, ending with an "fo" extension. Open the context menu (i.e. right-click the file), and open the "Render" submenu. 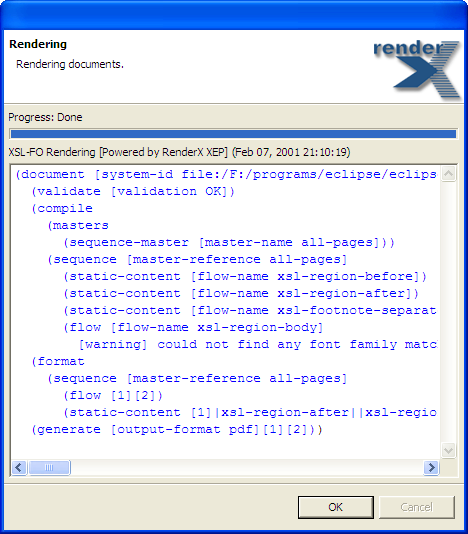 Select an installed rendering engine and an output format supported by that engine, and a progress window will open and show you a log of XEP's progress. XEP Bridge is available under the GNU Public License. For alternative licensing, please contact me. Without RenderX's XEP engine, this project couldn't have been realized. As with the FOP Bridge plug-in, I owe someone, somewhere, a thank you for the icons I used in the plugin. I think I found them on Interface Lift, but I can't be sure. I would love to hear feedback, be it positive, or, as they say in the euphemistic corporate world, "constructive". If you like the plugin or you think it can be improved, please shoot me an email.